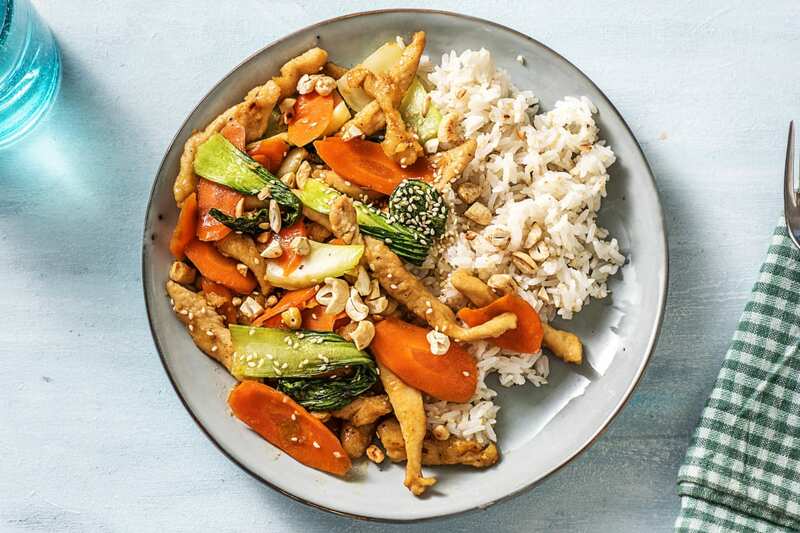 Forget takeout: the path to a savory, Asian-inspired dinner is as simple as breaking out a pan and stir-frying up a storm. 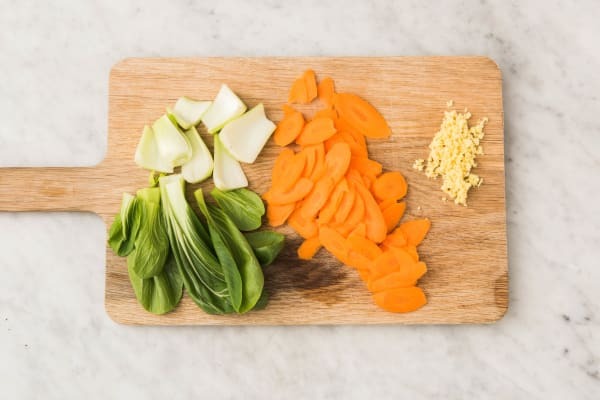 This recipe starts with chopping up some bok choy, carrots, and fragrant aromatics. Then, you’ll shift gears for a bit to focus on steaming the rice and toasting the nutty cashews. Afterwards, it all comes back to tossing around those veggies in a pan, followed by pieces of chicken and a savory sweet sauce. The results? A symphony of flavors. Wash and dry all produce. Peel ginger, then mince or finely grate. Trim and discard bottom root ends from bok choy, then separate stalks. Peel carrots and slice very thinly on a diagonal. Pat chicken dry with a paper towel and place in a medium bowl. Add cornstarch, salt, and pepper. Toss to coat. 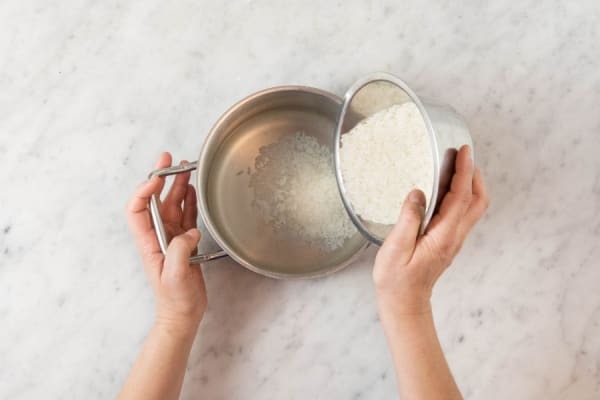 Bring 1 cup water and a pinch of salt to a boil in a small lidded pot. Once boiling, add rice and stir. Lower heat, reduce to a gentle simmer, and cover. Cook until tender, about 15 minutes. Remove from heat and let stand, covered, until meal is ready. 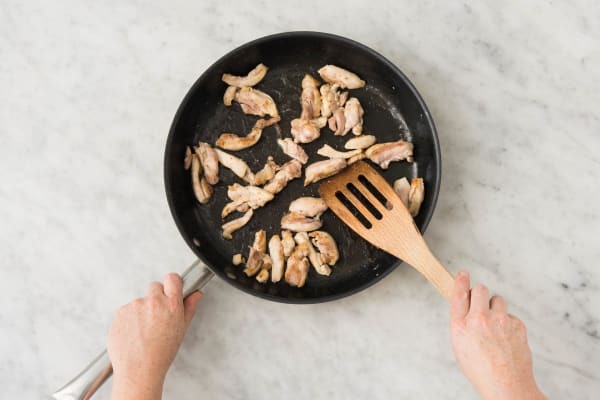 Put cashews in a large pan and place over medium-high heat. Toast, tossing often, until golden, 3-5 minutes. Transfer to a plate. Wipe out pan, then add sesame seeds. Return to medium-high heat and toast seeds, stirring often, until golden, 3-5 minutes. Transfer to another plate. Wipe out pan again. Heat a large drizzle of oil in same pan over medium-high heat. Add carrots and 2 TBSP water. Cook, tossing, for 2-3 minutes. Add bok choy and cook, tossing, until just tender, 3-5 minutes. (TIP: Add a splash more water to speed up cooking.) Season with salt and pepper and transfer to another dish. Wipe out pan and heat another drizzle of oil in it over medium-high heat. Add chicken to same pan and cook, tossing occasionally, until no longer pink, 5-7 minutes. Season with salt and pepper. 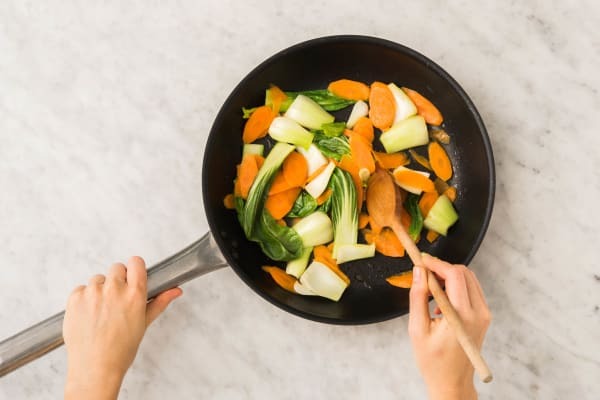 Add to dish with veggies. Reduce heat under pan to medium low, then add ginger and 1 TBSP butter. Cook until fragrant, about 1 minute. Stir in soy sauce, honey, ½ cup water, and stock concentrate. Bring to a boil, then lower heat and reduce to a simmer. Cook until thickened, about 3 minutes. Season with salt and pepper. Add veggies, chicken, and half the cashews to same pan and toss to coat with sauce. Fluff rice with a fork, then stir in half the sesame seeds. Season with salt and pepper. 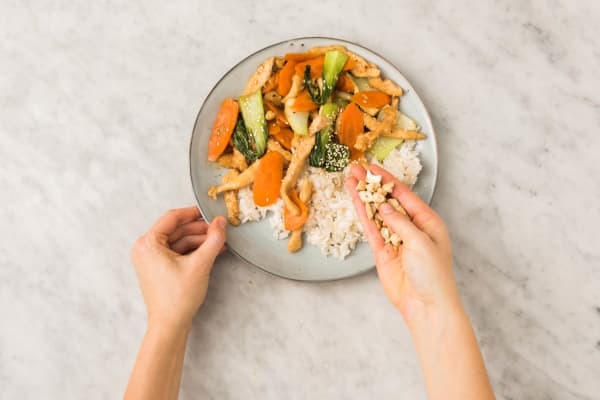 Divide rice between plates with chicken stirfry to the side. Spoon any remaining sauce in pan over chicken. 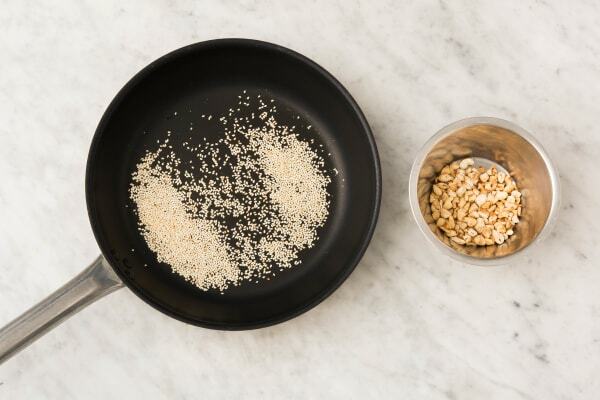 Sprinkle with remaining sesame seeds and cashews.